Express your own individual style! This pendant (optional necklace) with the word "hope" gives inspiration and encouragement to trust God during times of trouble and believe in the best to come. A meaningful gift for a friend or loved one facing a difficult time. 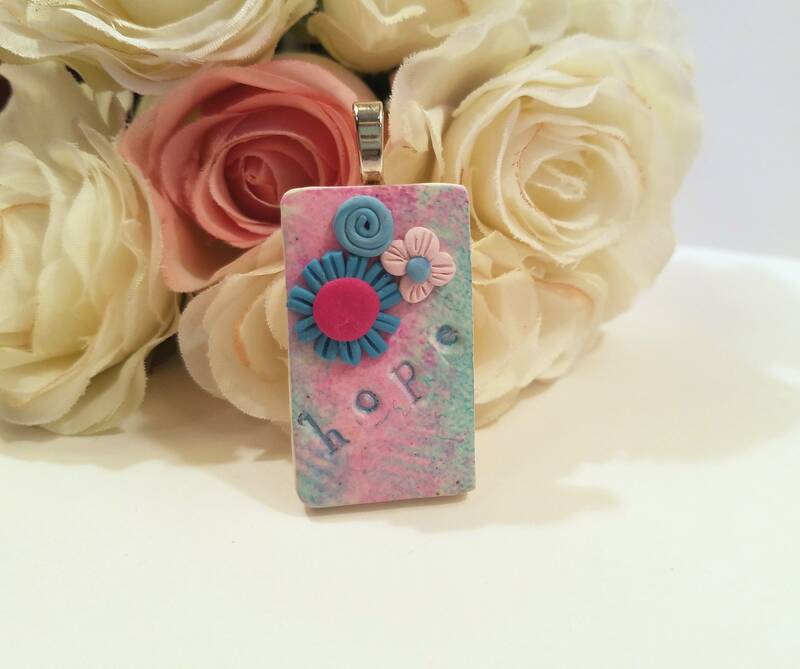 Handmade of white polymer clay, colored with pink and blue inks, with the word "hope" imprinted in blue, and tiny handsculpted flowers in shades of pink and blue. Measures about 1 inch wide x 2 inches (5 cm) tall including a large aanraku silver-plated bail. Wear as a necklace, hang as a decoration. Would you like a RIBBON FOR HANGING? (no charge) Write me a message in NOTE TO SELLER at time of purchase. OPTIONAL: add a pretty shiny silver plated 18 inch OR 24 inch vintage style chain, with oval loops approximately 3mm x 4mm and a lobster clasp closure.